Nestled in a quiet and peaceful corner of the Yorkshire countryside, midway between the Yorkshire Dales and the North York Moors, Kiplin Eco Lodge Park provides five luxury lodges in a truly tranquil location. A beautiful rural setting amongst ancient woodland and just a short stroll from Kiplin Hall, boasting acres of magnificent parkland, woods and gardens; perfect for leisurely strolls and picnics, while close by the pretty village of Scorton boasts a convenience store and great pubs. These delightful Yorkshire cottages have their own private veranda, and all five also have their own private hot tub for guests to enjoy. Boasting a high standard of accommodation with a contemporary, homely feel, these Richmond cottages have been skilfully constructed to provide holiday homes of real style in a beautiful location. There is an array of good walks and biking opportunities from the doorstep of these Richmond cottages, whilst the nearby market town of Northallerton plays home to the famous Bettys tea room, Lewis & Coopers Food Emporium, as well as Barkers department store. Further south is the market town of Thirsk, home to the James Herriot Museum and Thirsk racecourse, a great day out! Nearby Richmond is a real delight, discover the ancient cobbled streets and architecture, featuring an array of superb inns and restaurants and several intriguing museums. Explore the fascinating Norman castle, peruse the colourful stalls at the weekly market, or take a leisurely stroll along the picturesque River Swale. A superb location for exploring Swaledale, the Yorkshire Dales National Park, York Minster and the North York Moors, making this Richmond cottage the ideal base for touring the North of England, whilst enjoying that little bit of extra luxury afforded by Kiplin Park. Offering a bright and spacious, warm welcome at any time of the year, this Yorkshire log cabin features a lovely decked balcony with hot tub, an open plan living area with a designer kitchen, dining area and sitting area, two delightful bedrooms, one with an en-suite and a main bathroom. 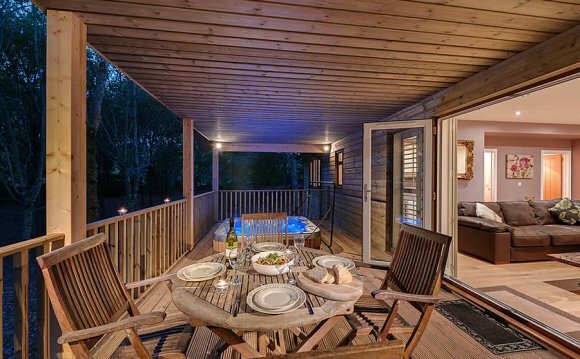 Step out onto the balcony where you can relax in the hot tub and watch the local wildlife, whilst admiring the peace and tranquillity of this lovely hideaway. Note: This property is near Refs. 911929, 27295, 27296 and 27297, together they sleep 30. All ground floor. Two bedrooms: 1 x double with en-suite shower, basin and WC, 1 x twin. Bathroom with bath, shower over, basin and WC. Open plan living area with kitchen, dining area and sitting area with sofa bed. Note: There is an unfenced water feature in the park, children and pets to be supervised.